E-Mail, the most common medium used for communication. People also use email for sending sensitive and important emails, which has to be protected. To safeguard these emails; your mail account should be protected from hackers, who are very interested in cracking everyone’s email account to show sensitive emails and information. Here I’ve offered few tips to keep your mail accounts safe and protected. If your password is long, then it is nonvulnerable. Always do remember not to use your name as your password. Even if you use that kind of password, make sure that you make it complicated by using special characters, numbers and few upper case letters. Also, make security questions hard that nobody can guess it. Have a habit of changing your password often. Check your recovery email after changing the password. Remember not to use the same password for any other accounts associated with it. Recommended: How Should be a Password! No email service provider will ask your password through emails or calls. If you have such emails that ask for your password, kindly decline it. Don’t send your email account info or your bank details to such kind of spam emails. If any email requested you to try a new website with the link provided within, either decline it or use it in a new tab clicking on the link associated with that mail may end up in hacking your password. Most of the people have the habit of not signing out if they use their personal PC. Even if you are the only person using that PC you should sign out properly when it is not in use. It applies to mobile users too. Don’t log in into your email account from public places. There may be some programs installed to Monitor every movement of you. Beware of the key logger, the most familiar scam used to hack all your passwords. 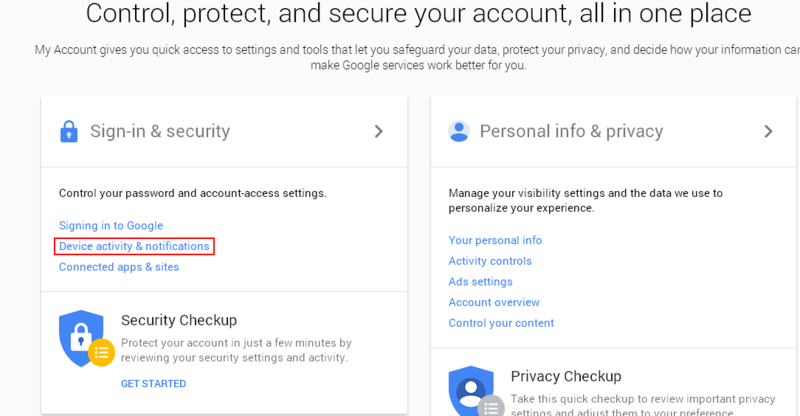 I’ve given few tips to safeguard your Gmail and yahoo account, since, these email service providers are the most dominant. In ‘The Accounts and Import’ tab click on the option ‘Other Google account settings’. It will direct you to a new page. On that page click on ‘Sign in & security’. Scroll down to find the option ‘2 step verification’. Select that and click ‘Start setup’ which in turn prompts you to enter your password. Enter your phone number and select either ‘send SMS’ or ‘voice call’ to send the code. You will receive an SMS or Voice call. Enter the code in the next step and click verify. If you are using your personal PC or a trusted computer, just click next. In case if your mobile phone is missing you could access your Gmail on the desktop which is specified as a trusted one. Click ‘Confirm’ button. If you sign in from an unknown device you will receive an SMS and mail saying that “your account is being used in some other location”. By clicking on ‘Device activity and notification’ option you may see your sign in history if you sign in from unknown desktops or mobile phones. Settings -> Accounts and import -> Change password recovery option. It asks for your password. Provide a mobile number and your alternate email Id and click ‘Save’. If you lost or forget your password, this helps you to recover your account. Security measures are more or less same in Gmail and yahoo with little differences. Click on the gear bottom on the right corner of the window and select ‘Account Info’. It takes you to a new page. In the left pane, click on ‘Account security’ option. Enter your phone number and verify it by entering the code that has been sent to your mobile. Enabling the two-step verification will prompt your counter and phone number. Enter the code sent to your mobile phone and click ‘Verify’. 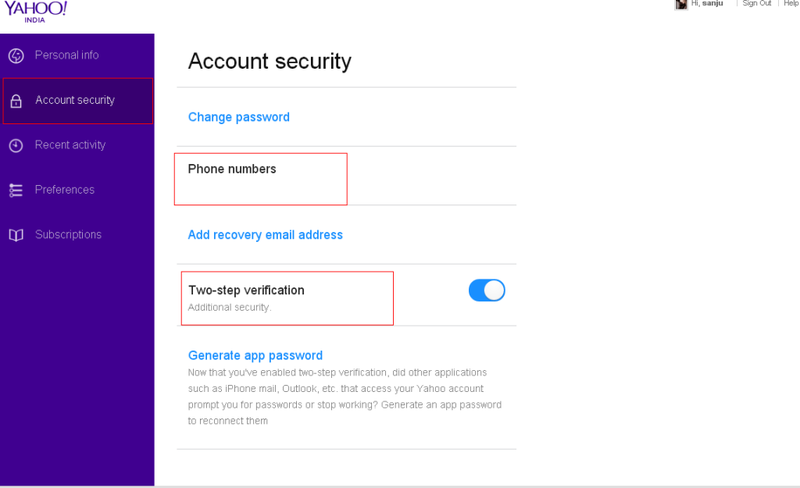 Now you could connect your iOS and windows app to your yahoo account with a special set of passwords for it, since, those apps will not support two-step verification. Previous articleVLC media Player Tips and Tricks – Best 10 Must Know Tips!